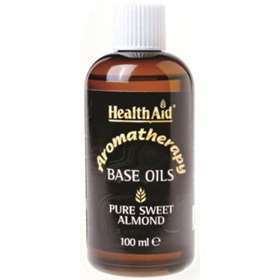 HealthAid Pure Sweet Almond Base Oil is one of HealthAid's Aromatherapy Base Oils range, rich in vitamins that penetrates the skin to support healthy, beautiful skin. Sweet almond oil can be used on your face as well as your body and may help to improve your skin's complexion and glow. It can also help soothe irritation, relieve dry skin and even be used in your hair to help provide nourishment. HealthAid's Aromatherapy Base Oils like this product can be transformed into your own unique massage oil blend by adding any of HealthAid pure aromatherapy oil. Rich in vitamins that penetrates the skin. May help to improve your skins complexion and glow. Helps soothe skin irritation, relieve dry skin and provide hair nourishment. Can be transformed into your own unique oil blend by adding 15 drops of any HealthAid pure aromatherapy oil to 30ml of HealthAid Pure Sweet Almond Base Oil. Massage into skin (body and face) or hair.